8 Rabi ul Awal: Martyrdom Anniversary of maula Imam Hassan Askari (A.S). 8th Rabiul Awwal marks the martyrdom anniversary of Maula Imam Hasan Askari (A.S).Shaheed Foundation Pakistan extends its heartfelt condolences to Imam-e-Zamana a.t.f.s ,Masoomeen Alaihimussalam, Marajee`n ,Ulema and Momineen o Mominaat on the sad occasion of Shahadat Anniversary of the eleventh Imam. Imam Hasan Askari (Alaihissalaam) was the eleventh vicegerent of Prophet Muhammad PBUH and thirteenth Infallible. His given name was Hasan Ibn `Ali Ibn Muhammad (Alaihimussalam). His title al-Askari derives from the Arabic word Asker which means military. He was given this title mainly because the city he lived in (Samarra) was a military camp. Imam Hasan al-`Askari (AS) was 22, when his father was martyred. 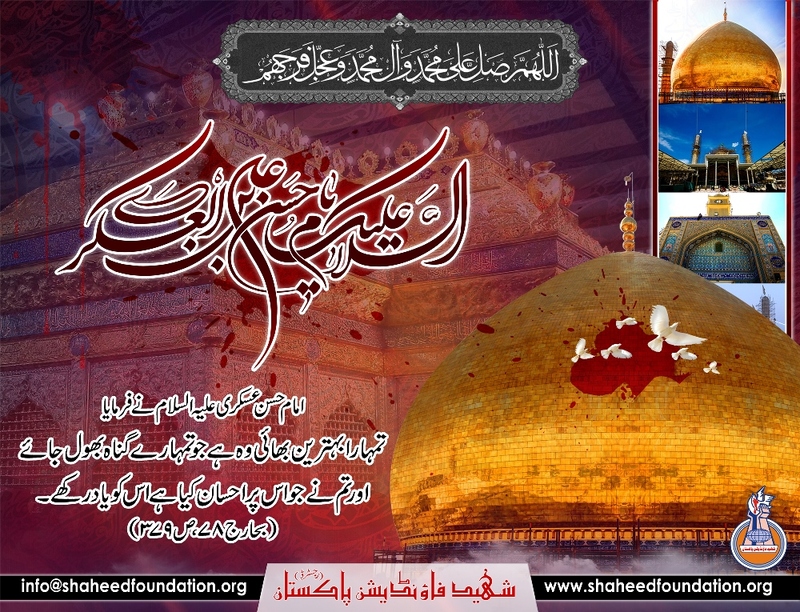 The period of his Imamate, following his father`s Shahadat , was six years. Imam Hasan Al-`Askari embraced martyrdom at the age of 28 in the year, 260 Hijra and was buried in Samarra. One of the major responsibilities of Imam Hassan al-Askari (AS), for which he endeavored earnestly was to introduce the Imam after him to the Shiites and to inform them of the next Imam`s occultation. At the time, the Abbasid dynasty, having had heard the words of the previous Imams (AS) and those of Prophets` (AS) about the savior that would be born to Imam Hassan al-Askari (AS), were in close watch of Imam Hassan`s (AS) residency to make sure he would not have a son. Thereupon, Imam Hassan al-Askari (AS) had to hide his son from the guards sent by the government and in that manner save his son`s life. After the martyrdom of Imam Hassan al-Askari (AS), Imam Mahdi (AS) went into the periods of his minor and major occultation, whereupon most Shiites were deprived from seeing their Imam . Upon this matter, at the time of Imam al-Askari (AS) it was necessary to introduce Imam Mahdi (AS) to certain Shiites, and clarify his processes of occultation. Many narrations have been recorded on this matter, but in this excerpt we will refer to only one. `O Ahmad! If it were not for your eminence in the eyes of Almighty Allah and His chosen people, I would not have shown you my child. His name and kuniyah are the same as that of Prophet Muhammad`s (S.A.W.W); and it is he who will fill the earth with justice after it has been corrupted with oppression. By Allah! He will live through a long occultation from which people will not survive perdition and deviation, except for those who stand firm on believing in his Imamate, and those who are honored with the opportunity to pray for haste in his reappearance." "I am the remainder of Allah (Baqiatullah) on earth; the one who will take revenge on the enemies of Allah; and after seeing me, do not search for any other signs!"
. Imam Hassan al-Askari (AS) has said: "There are two characteristics, which surpass all others: having faith in Allah, and benefiting one`s brothers (in faith)"
. Do not dispute (with others) lest you will lose splendor and do not joke (with everyone) lest you will be disrespected.
. As for those who accept to sit in a place other than the first row of a session, Allah and His angels will bless them until they leave that session.
. Imam Hasan al-Askari(A.S)`s answer to the man who asked him a miracle or a proof of Imamat: The punishment will be doubled for those who refuted the miracle or proof of Imamat after it had been presented to them according to their demand. He who shows patience will be supplied with the support of Allah. People are accustomed to publicize false missives that they themselves forge. We supplicate to Allah for guiding us (to the right). Matters are either submission or destruction. The end results of everything belong to Allah.
. The faithful believer is a blessing for the believers and a claim against the disbelievers.
. The heart of the foolish is in his mouth and the mouth of the wise is in his heart.
. The guaranteed sustenance should not engage you from the ordained deed.
. The excessiveness of the (ritual) ablution is as same as defect.
. The powerful will be definitely humiliated if he ignores the right and the Humble will be definitely valued if he takes in it.
. Fatigue is the friend of the ignorant.